Your GO-TO summer salad! Our Watermelon Basil Salad is light and refreshing. Perfect for summer cookouts, backyard parties, potlucks or picnics. 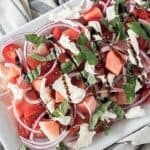 This Watermelon Basil Salad is quick and easy to make and is sure to please with the fresh, healthy flavors of summer. I truly believe that watermelon in salad is the MOST underrated salad ingredients in the world!! Seriously, if you haven’t tried this Watermelon Basil Salad then you have to get on to it pronto! If you’re looking for your next summer salad recipe, then this is it! This Watermelon Basil Salad is so light and refreshing! Picture this: backyard, sunshine, family and friends around, massive grill up, sangria and this delicious salad! I am SO ready for summer to arrive! Aren’t you?! While you may be thinking that putting watermelon in a salad is an odd combination, I am here right now to dispel that myth! 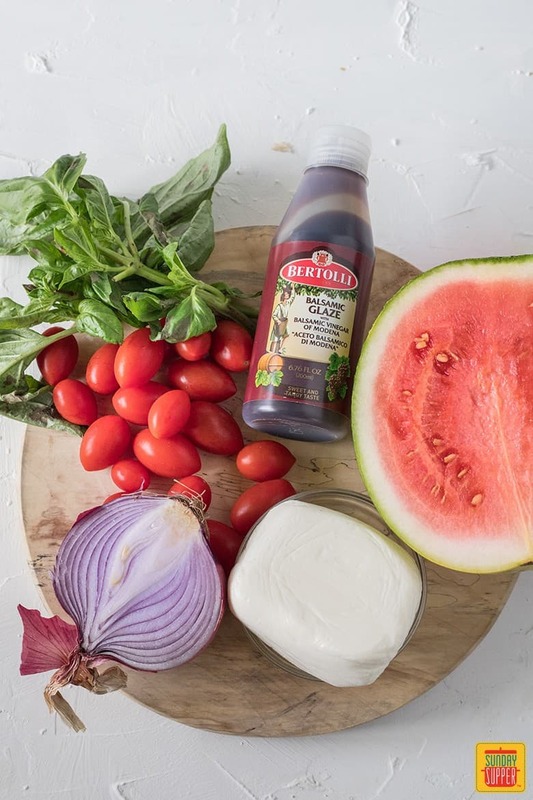 The sweetness of the watermelon goes so well with the sweetness of the tomato, which is then cut through with a little acidity from the balsamic glaze. To top it off, the combination of mozzarella and basil kind of makes you feel like you’re eating a healthy margherita pizza in salad form! Can’t argue with that! 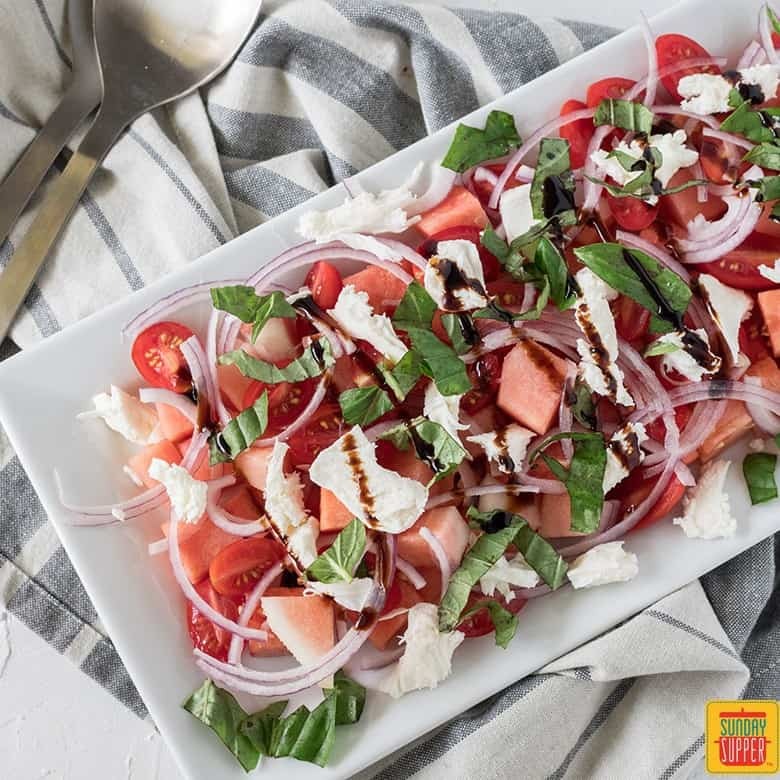 To make this watermelon basil salad, you simply cut up the ingredients and arrange them nicely on a platter. Then top with the basil, mozzarella and balsamic glaze. It doesn’t get much easier than that! Use ripe watermelon! Trust me on this one, unripe watermelon makes the salad taste bitter. 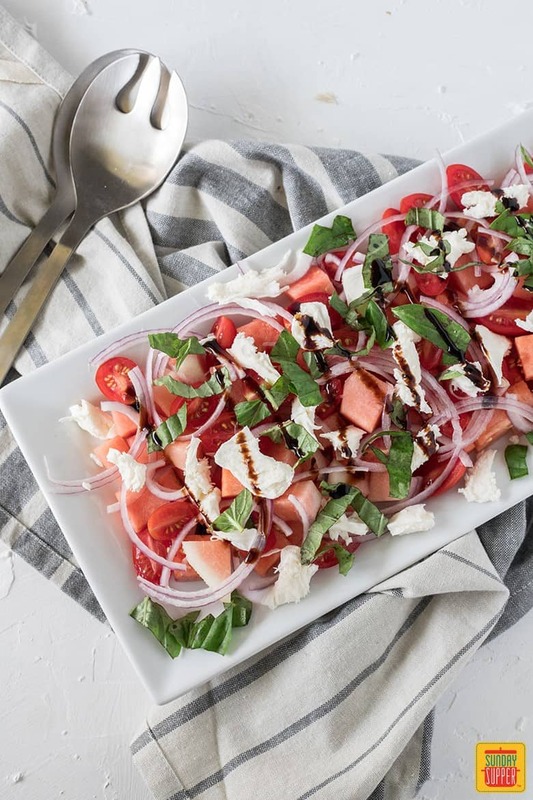 Ripe watermelon makes the salad nice and sweet and cuts out the acidity from the onion and balsamic glaze. I opted to use mozzarella, but feta cheese would also be a good option. I used a ball of fresh mozzarella then tore it apart to add. Balsamic glaze is easy to find in most supermarkets and is well worth a purchase! Unlike balsamic vinegar, the glaze has a slight sweetness to it and is nice and thick making it perfect for a dressing. The onion needs to be very, very finely sliced! The addition of chicken in this Watermelon Strawberry and Chicken Salad would be so, so good! If you love margaritas this frozen Raspberry Margarita with watermelon is for you! Love this recipe? We’d love to hear all about it!! Leave us a comment and a rating, and happy almost summer! 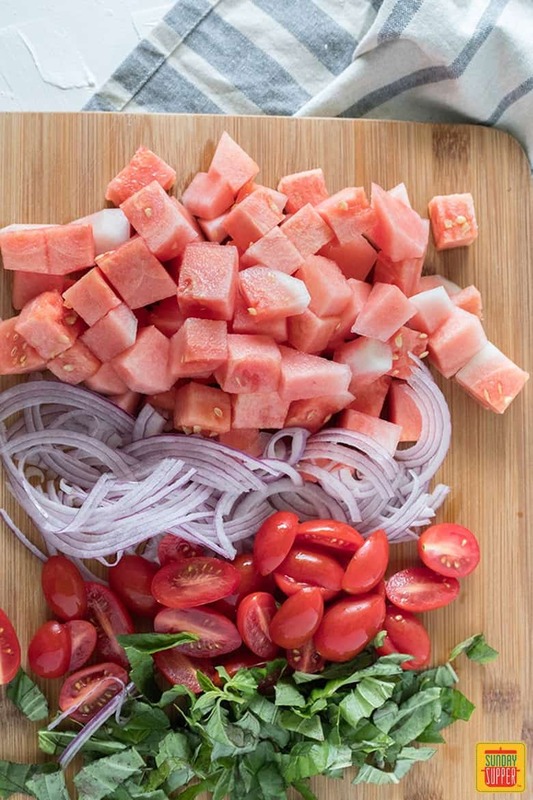 Lay diced watermelon on a platter, and top with red onion and halved cherry tomatoes. Top with the mozzarella and fresh basil. Drizzle over the balsamic glaze and serve.